At it’s core, a CRM application is essentially a database for collecting and tracking various pieces of information, from contact info, to qualifying information, to activities and communications, to notes, etc. It’s how you use it that determines the value that you and our organization derive from it. Of course, within an organization there are many departments and individual roles with their own focus and interests. Hopefully, they’re all aligned and operating in ways that are synergistic – as a team you can say – with a common guiding mission and complimentary goals and objectives. Retain Prospect & Customer Contact Information – if you can’t reach them you can’t sell to them. Capture Useful Details – in the course of conversations a salesperson should be learning information needs to retained and used during the sales process. e.g. qualifying details, expressions about needs and objections, priorities and other key points, etc. Milestones and Markers – there are points or stages in the sales process that mark progress or lack thereof. Such information may be essential to what the salesperson is required to report to management. A salesperson must be accountable and the CRM system enables to meet this requirement more accurately and efficiently. Lead Distribution – long before the Internet age, marketing has had a greater responsibility for the functions which generate sales leads. Whether those leads are captured by a receptionist or a web form, or even purchased, they need to be distributed. A CRM system is the best means for the capture and distribution of leads. Automation and Augmentation – A CRM system offers many features which a company can leverage to help it’s sales team operate more efficiently, consistently and with greater results. 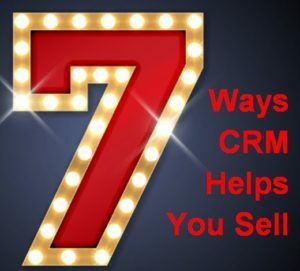 From drip marketing to fulfilling prospects’ requests for literature, to scoring or ranking leads, a CRM system can increase productivity by augmenting the salesperson’s efforts. 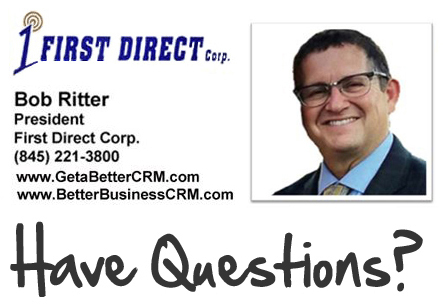 The Soft Value of CRM – The capture of “notes” can be very helpful for what I like to refer to as the “R in CRM.” This has to do with the ways sales people need to build rapport, a relationship, loyalty, etc. Working Your List – Doing one’s day in business often amounts to managing a list of tasks and seeing to it that you’ve completed your list each & every day. For a salesperson, that may be a list of new leads, planned follow-up activities, or a pipeline of sales in-progress. While there are various ways to manage a list including even good old fashioned paper and pen, or an Excel spreadsheet, or an electronic calendar, only CRM has the advantage of automatically keeping the list and results together with your database of contacts in such a way that both the pending and complete task list they can be easily accessed, shared, and reported. We’ve all heard the phrase, “Knowledge is power.” When it comes to a well organized and maintained CRM database, that knowledge is the power to sell more. It is also the power to meet the needs of your prospects and customers. Ultimately the power to increase a company’s revenue and your sales commissions!